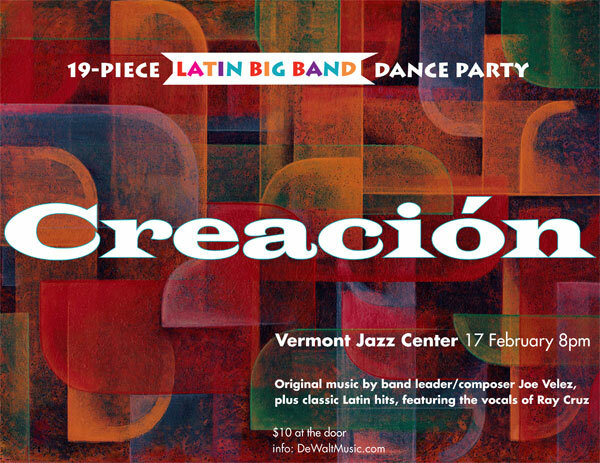 The 19 piece latin big band Creacion will be bringing its exciting and gigantic sound to the Vermont Jazz Center in Brattleboro VT on Friday February 17, at 8PM. Founded by composer/pianist Joe Velez the band not only plays the popular music made famous by greats like Tito Puente and Bene More, but also features original compositions written by Velez especially for the band. NYC native and Springfield resident Joe Velez has performed with Orquesta Santurce in Los Angeles CA, The Pan Americana de Puerto Rico, Domingo Quinones, Tito Allen, Pupi Legaretta, Henny Alvarez, Mario "Cora "Alvarez, La Charanga New England, Herman Olivera, Gary Nunez, Luisito Ayala, Los Pleneros Del Coco, and Dave Valentin, just to name a few. The Creacion Latin Big Band will feature the vocals of Ray Cruz, who has collaborated with Velez in the New England region for the last thirty years. 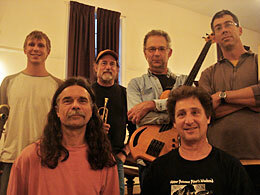 The musicians in the band are seasoned professionals who hail from MA, CT and VT. Trombonist Jim “Mondango” Messbauer anchors the trombone section, along with Joe Sabol, Mark Turcotte and Dan Dewalt. Saxophones: Jon Weeks, Adam Scotera, Ron Smith, Ed Mari and Cliff White. Trumpets feature Dave Bileado, Charlie Schneeweis, John Jones and Judd Peskin. The rhythm section features: Ray Natar congas, Anthony Perez percussion/bongos, Jeff Nissenbaum drum kit, and Carl Oman Bass. Creacion combines Cruz's vocals, vibrant coros floating over montunos and burning instrumental solos. The Vermont Jazz Center has seating and a dance floor. After a December show featuring a Latin Big Band with Jazz Center musicians featuring Eguie Castrillo, Brattleboro area residents discovered their “inner salsero” and will now get a second opportunity to polish the dance floor to the music of Creacion. Dan DeWalt composes music, plays piano, trombone and steel pan. 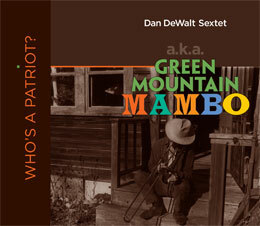 Green Mountain Mambo is his flagship band, but you will also find information and music about several other bands in which he plays. Please take a listen and you'll find something that you like.